Proving its serious about dual-purpose off-roaders against the usual trend of adventure bikes, Triumph Malaysia has launched the 2019 Triumph Scrambler 1200 XC and Scrambler 1200 XE, priced at RM80,900 and RM86,900, respectively. Prices are listed without road tax, insurance and registration. Both the Scrambler XC and XE carry identical versions of Triumph’s 1,200 cc High Power Bonneville parallel-twin, producing 88.7 hp at 7,400 rpm and 110 Nm of torque at 3,950 rpm on tap. This translates to 12.5% more power than the Bonneville T120 Modern Classic street bike and 38% more torque than the 900 cc 2019 Street Scrambler. Brand new is are full-colour TFT-LCD instruments with two user-selectable layout themes and the display can be personalised with the rider’s name. Included are riding modes- Road, Rain, Off-road and Sport – with a fifth user configurable setting while the Scrambler XE adds a Off-road Pro mode which switches off ABS and traction control. Braking is done with Brembo Monobloc M50 callipers on twin 320 mm floating discs with a single Brembo two-piston calliper at the back clamping a 255 mm disc. The Monobloc M50s are top-of-the-line road-going brakes and commonly found on top-of-the-line superbikes as well as the Triumph Street Triple 765 RS. The road-oriented Scrambler XC comes with Showa upside-down forks with 200 mm of travel, while the Scrambler XE gets 250 mm of travel. At the back, twin fully-adjustable Ohlins absorbers do the job with the XC getting 200 mm of travel and the XE gets 250 mm. Seat height on the Scrambler 1200 XC is set at 840 mm while the more off-road oriented XE comes in at 870 mm, and dry weight of the XC is 205 kg while the XE weighs in at 207 kg. Side-laced spoked wheels are standard on the Scramblers, 36-spoke 21-inch in front and 32-spoke 17-inch in the rear and shod with Metzeler Tourance tubeless tyres. A TFT-LCD digital display shows all the information the rider needs and includes a world’s first for motorcycles – Go Pro camera control using the optional Bluetooth module from the handlebars, as well as smartphone connectivity. Fuel is carried in a 16-litre tank and colour options are Jet Black/Matte Black and Khaki Green/Brooklands Green for the XC and Cobalt Blue/Jet Black and Fusion White/Brooklands Green for the XE. 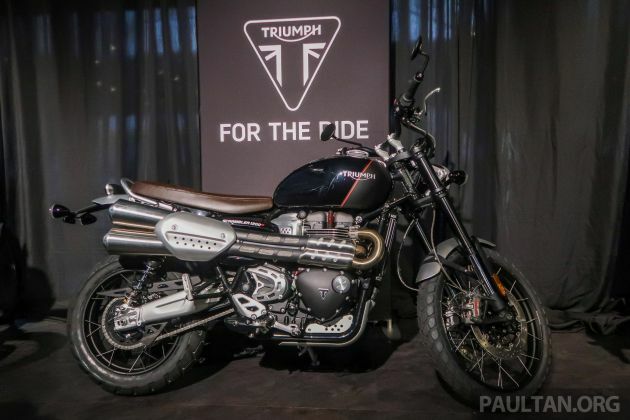 The post 2019 Triumph Scrambler 1200 XC and XE launched in Malaysia – priced at RM80,900 and RM86,900 appeared first on Paul Tan's Automotive News. 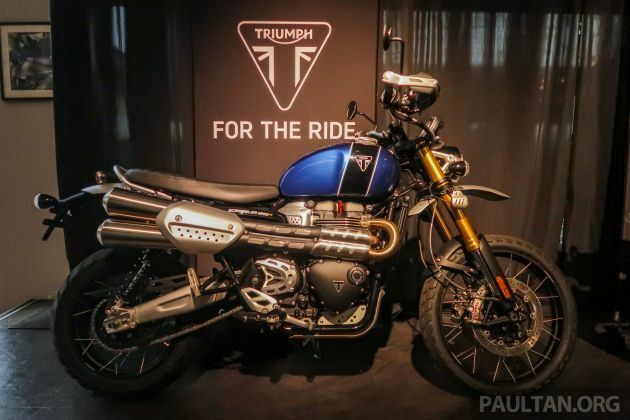 0 Response to "2019 Triumph Scrambler 1200 XC and XE launched in Malaysia – priced at RM80,900 and RM86,900"